Copyright � 2004 Audio Federation, Inc. 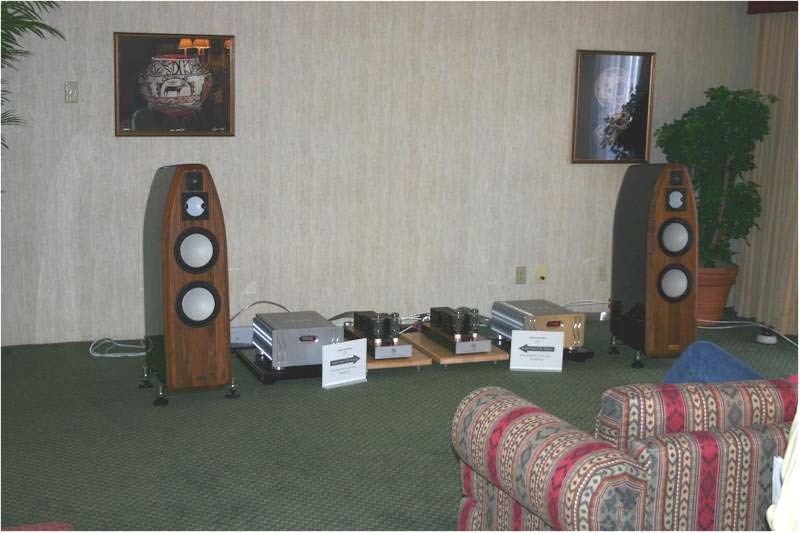 Welcome to our RMAF 2004 Show Report. This show report is a little different, in that we were primarily exhibiting rather than just focusing on listening at this show. Because of the limited time we had available, we are not able to provide as much detail about the sounds of the other rooms as we like to do in our usual show reports. However, we certainly can describe what we heard as well as talk about what it was like to actually exhibit at an audiophile show. Al Stiefel (Red Rock Audio) and Ron Welborne (Welborne Labs) were the show organizers... let's have a moment of silence for a couple of guys (and everybody behind the scenes) who jumped in and not only didn't drown - but managed to put on a very successful show that was much larger than originally expected, and managed to do so in amazing good spirits, especially considering what a whiney and crabby lot we dealers are. The show was held at the Denver Tech Center Marriott, in the middle of one humongous office park with very windy roads within which it is easy, very easy to get lost. Very lost. Our home/store is located in Boulder just about exactly one hour North of RMAF. Intending to take the equipment we were going to use for our system down to the show Wednesday morning - it was, of course, raining. And, Mike and Neli, in their infinite wisdom, happen to have their showrooms 45 steps above the driveway, the steps being outside under the unpredictable sky. So it was not looking too good that morning. But, by keeping close watch on the movements of the cloud cover on http://www.weatherunderground.com, we took advantage of a couple of 15 minute breaks in the downpour to rush a few of the lighter pieces down to the rented minivan and my sedan - which were the two cars which we were going to use to lug the stuff down there (we did not box everything, which allowed us to pack more equipment into a tighter space). Around 3 pm the weather cleared and after loading we drove down to the Marriott and arrived around 7:30 pm. We then checked in and went up to see our room for the "very first time. like a vir-ir-ir-ir-gin" (it was our first show as exhibitors...). 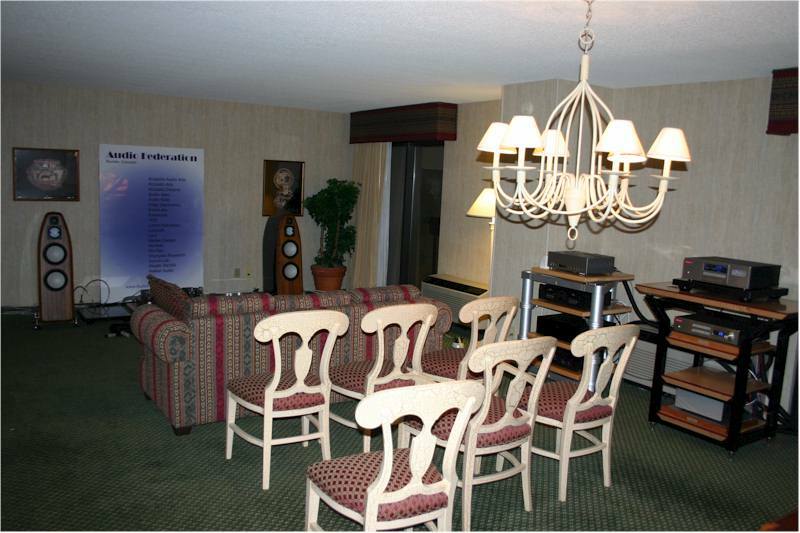 The room was a nice suite; a large room to which was connected a modest bedroom, in which we slept (one of the show attendees said that he once worked as a bellhop in that very same hotel and that he brought room service to Barbara Bush in that very room. All I can say is that the room was nice, but not that nice). 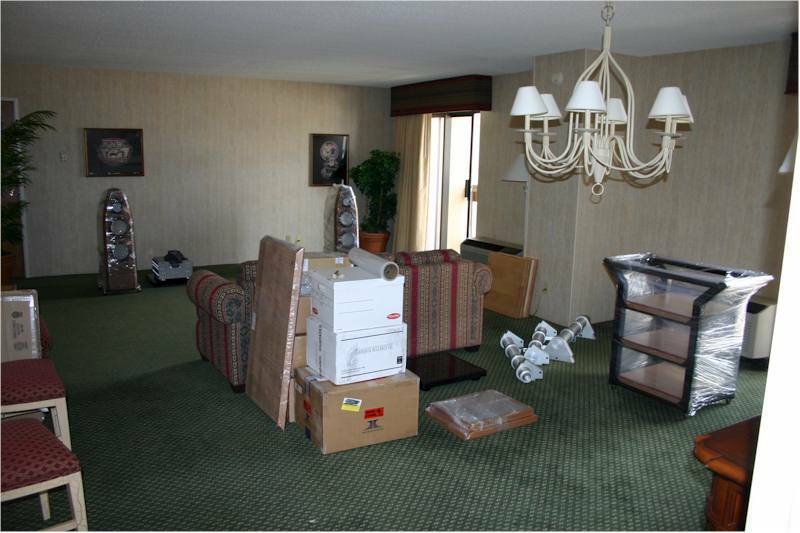 We had specified what furniture to have removed (armoire, hutch, tables, etc.) and which to keep (sofa, chairs, etc). Because we hadn't seen the room or its furniture before, and because we had submitted two different Furniture Removal Requests (another long story) we didn't really know what we were getting ourselves in for. But, with moving dining tables and desks and giant planters around - we managed to create a space for some listening. More on room setup later. The list of equipment used in our show system is listed here. 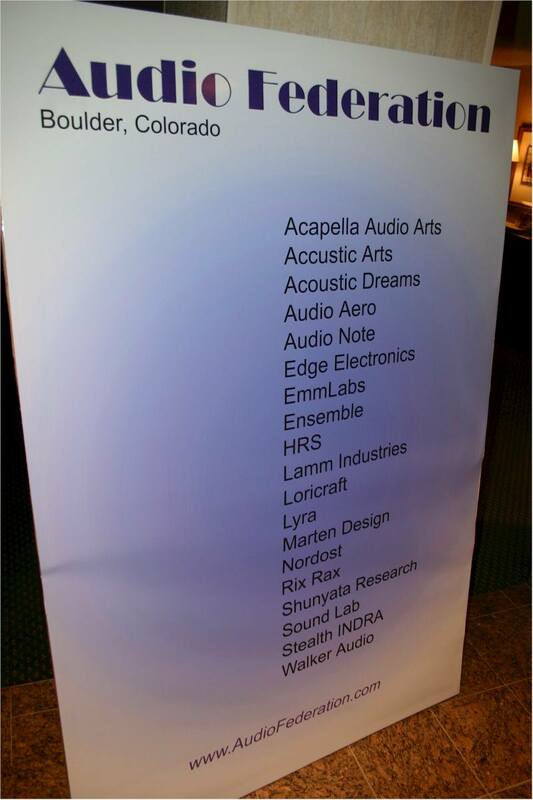 Every single piece was instrumental in achieving the quality of sound we were able to produce at the show. O.K. 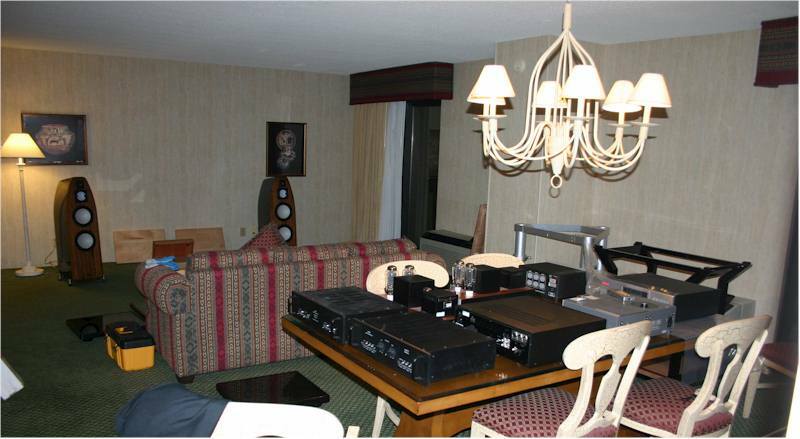 Our room is on the ninth floor, our equipment is in two vehicles in the parking lot. How does one get heavy equipment from point A to point B, in a reasonable amount of time and without multiple hernias? We had a bell man help us carry up some EDGE Signature One amps in San Francisco who used a bell cart. So we asked the front desk for a bell man and/or bell cart. We got a bell cart. During the whole show, I never saw a bell man (who usually want some $ for their services) piloting a cart with audio equipment on it. It is hard to exaggerate how great this is - not only does it save money - but one does not have to cringe every time the guy careens into a wall with $50,000 worth of equipment on board. So, after parking in front of the entry conveniently near the elevators, we found out just how much stuff one can get on one of those carts. It took us six or seven trips (each Coltrane speaker went up by itself on the cart). Once in the room it was time to unpack and unwrap everything. Where the speakers were going to go was obvious, but where to put the two racks (one Acoustic Dreams, one Rix Rax) was more difficult - as there was a column in the middle of the room and two large heater/coolers built into the wall we wanted to put the racks against. This was enough of a stumbling block, and we couldn't setup any of the front end until we made a decision, that we decided to sleep on it and not setup the system until the next day. It was then that we really realized just how close the Marriott was to the I-25 highway (the side of the building we were on was about 50 yards away from the highway and its giant overhaul/construction project which is called T-Wrecks [sic] hereabouts) and how thin the windows were and how noisy the traffic was. We really hoped this would not adversely affect the listening experience. In actuality it really wasn't too noticeable at the volumes people like to play things at at shows. Finally, Mike and Neli make a decision about where the racks go and Mike goes back up to Boulder to pick up the Signature Ones and wait for the emmLabs/Meitner DCC2 DAC to arrive and Neli sets up the system. The system is the exact same configuration (except for the emmLabs/Meitner digital front end) we used for the last 9 months or so. 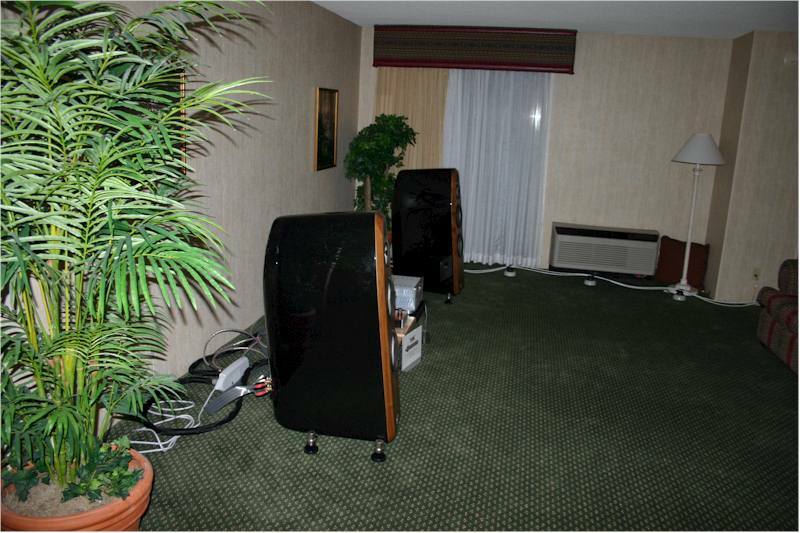 But the hotel room was larger and the speakers had a nice flat wall to go against. This made setup much easier than in the rooms we are used to and Dan Meinwald's (E.A.R. USA/Sound Advice, Marten Design distributor for the U.S.) contributions made it easier still. The speakers ended up being toed in ever so lightly, leveled horizontally, and pointed down so that they pointed more or less between the ear heights of listeners on the low-rider couch and those on the dining room chairs. They were pulled away from the wall until the bass on Marcus Miller's M2 sounded tight and crisp, but not so far that the soundstage lost its immediacy. 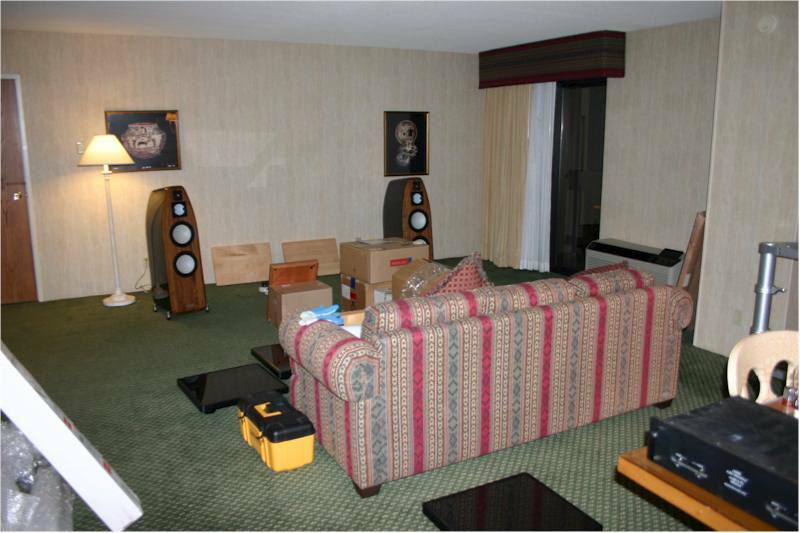 The were separated until the room was nicely loaded/filled with sound and the soundstage was slightly wider than the speakers. 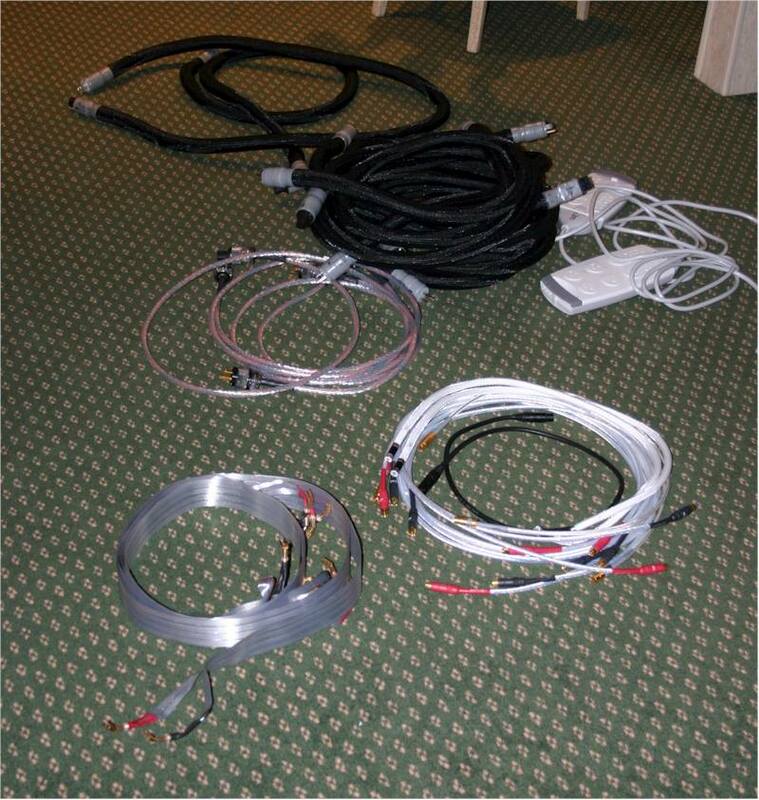 The outlet for the Shunyata Hydra-M8 on the front end was farther than 6 feet away, so we used a handy-dandy FBI to chain two 6-foot Anaconda Alpha power cords together. 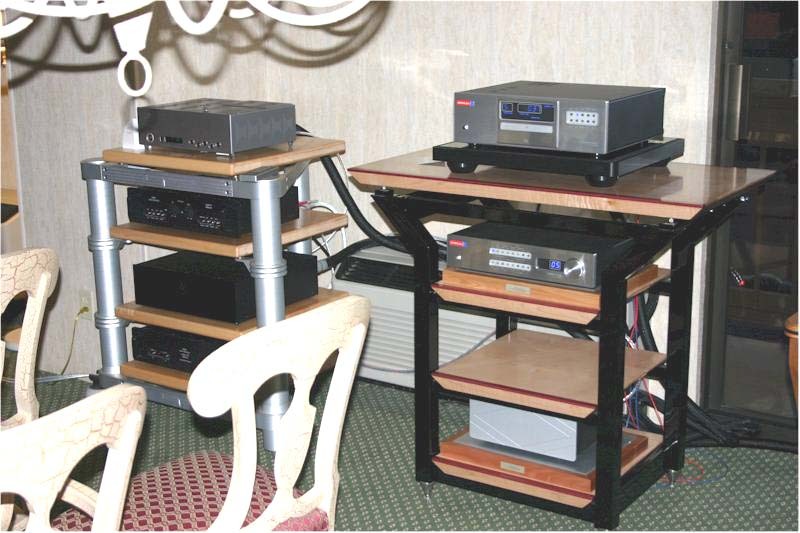 The Meitner was new to us, and we were uncertain about its performance, especially with regard to redbook CD playback. Additionally, the CDSD transport was brand spanking new. Out of the box the redbook sound was compressed and thin - so with trepidation in our hearts, we hoped for the best and put the transport on auto-repeat each night. By the end of the show, however, the Meitner surprised us and was neck-and-neck in most respects with our reference redbook front-end. Now, in our book, this is significant - our reference redbook front-end consists of the Ensemble Dirondo transport using a Valhalla digital interconnect (yes, it prefers a BNC interconnect but we did not order our Audio Note DAC with BNC-inputs) into the Audio Note 4.1x Balanced DAC and from that into the Lamm L2 linestage using the Stealth INDRA interconnect. This is a highly optimized setup that we have worked on/with for a long time. Overall, we probably still prefer this over the Meitner on redbook, being more natural and musical, but it lists for over $27,000 (including cables) compared to the Meitner's $20,000 (including cables) and does not play SACD and the CDSD only had 3 days on it and we expect it to continue to relax and improve as it continues to break in. The show started at 12:00 noon on Friday. 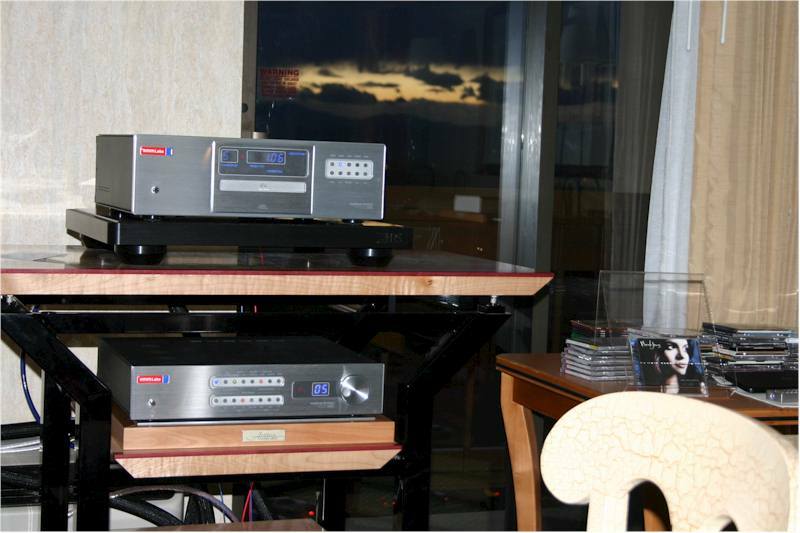 We played the Audio Note Kegon SET amps in the mornings and EDGE NL Signature One solidstate amps in the afternoons. We played ordinary redbook CD on the Ensemble / Audio Note pair and SACD on the emmLabs pair (except for the last day, which was a free for all), toggling between them each CD track we played, first one then the other. The system continued to get better over the successive days. We were able to keep the Signature Ones on almost continuously, keeping them on even when they weren't plugged into anything and the Kegons were playing. Overall we were pleased with the sound in our room. We had a steady flow of people into the room and were happy with the turn out. Although we had originally planned on our banner being against the wall between the two speakers, but because we were at the very end of the hallway and felt nobody would ever know we were down here, we put the banner outside the room. Our neighbors must of thought similarly, as they eventually did the same with their banner. Being a local show, we got to see many of our friends which was very enjoyable. We also met a lot of new friends, both local and not, which made the whole experience more like a block party than work. Thanks, everyone, for stopping by - it was a blast! Tube rolling (the Audio Note Kegons did great, even at 22 watts, in the bass department for those that like tube bass, though a few times a very loud midrange could tax them severely. We used the EAT 300B which are great for adding more punch and control over the bass. But people who do not like tube bass - who want to hear solidstate-like detail down there - were not impressed - and so we could have gone with the Sophia 300B, because we were not going to impress the I-want-detailed-bass people, and the Sophias have a more lush, more delicate and detailed midrange that tube lovers die for and at which the Kegons excel like few other amps in the universe). 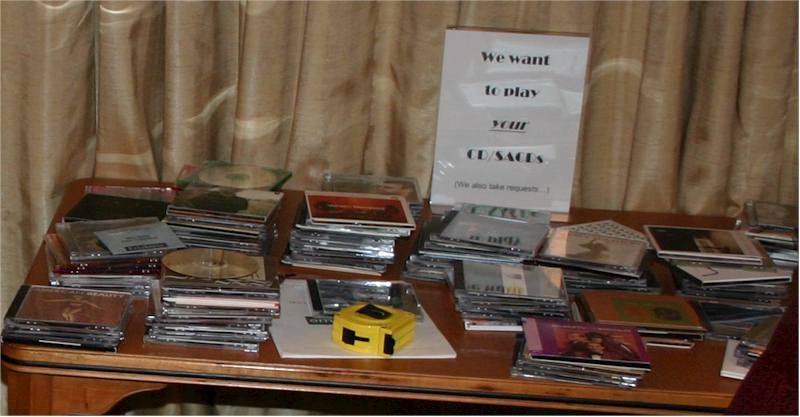 I had the most fun, personally, when I was able to convince younger audiophiles to let me play their discs. They are so shy/embarrassed/intimidated that they do not think they can ask exhibitors to play Radiohead or Tool or White Stripes or whatever music that they actually like and listen to all the time and plan on listening to and would like to have a nice system on which to play their music. The oh-my-god expression on their faces as they hear how the music really sounds, all the detail and the bass, and the delicacy and the beat, at loud, albeit not concert-loud, volumes is priceless. 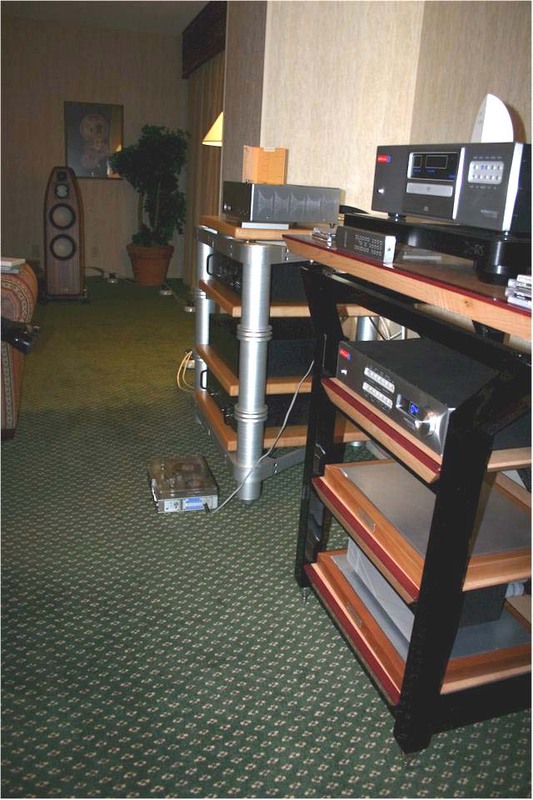 Those that think high-end systems are only for audiophile music are missing out - a well designed system, one that is designed to play CDs well, can play just about anything and make it sounds great to the person who enjoys the music. One of the most disorienting and intriguing incidents occurred when I was talking to Jarmo, a friend and dealer from Sweden and Kelly, and friend and manufacturer from Denver, when a fella, whose name I did not catch because I was under the incorrect impression that either Dan or Albert Porter knew this guy, came in and asked if I would hook up his portable Stellavox reel-to-reel deck (something like this on Savant Audio's website) into our system. I looked at Dan and Albert, and they just kinda sat there and looked back, and I thought "oh these guys must know this fella and he must be OK" and so I said sure, but wondered out loud if we had another pair of Valhalla interconnects laying around (which we did). So this guy whips out a pair of one dollar radio shack interconnects and says he has some 'right here'. I try to convince him that we might have better sounding interconnects but he then correctly points out the obvious that the required interconnect must have a 9mm? plug on one end. OK, we use the radio shack interconnect then - except that they do not stretch apart to fit into the 'Direct' input connectors on the Lamm L2 linestage. So, he then proceeds to rip part of the interconnect into two pieces long enough to work. Then he proceeds to play a tape. I forget what it was (Coleman Hawkins? ), and I was still in the middle of a number of conversations. But the sound was so - smooth, round, harmonic... There seemed to be only one song per tape and they were apparently dubbed off the master tapes. Then he played the first track on Miles Davis' Sketches of Spain. OK. I've heard the 45 speed LP version on the Walker turntable a number of times. Now, I'm not saying which is 'better', because I really do not know. LPs have a characteristic sound - a sound many of us find nostalgic, along with a number of audiophile qualities that CDs are still hard pressed to match. I am sure that reel-to-reel also has a characteristic sound, a color, one that, although my parents had a reel-to-reel as I grew up, I am at this point not familiar with. I am sure that radio shack-like interconnect was adding/removing something it shouldn't be, but the sound was gorgeous and handily beat the currently available software on the best SACD player available (the Meitner). Neli came into the room during the last tape track. Her thought process, she says, went something like "Wow. Look at that thing. What is that? 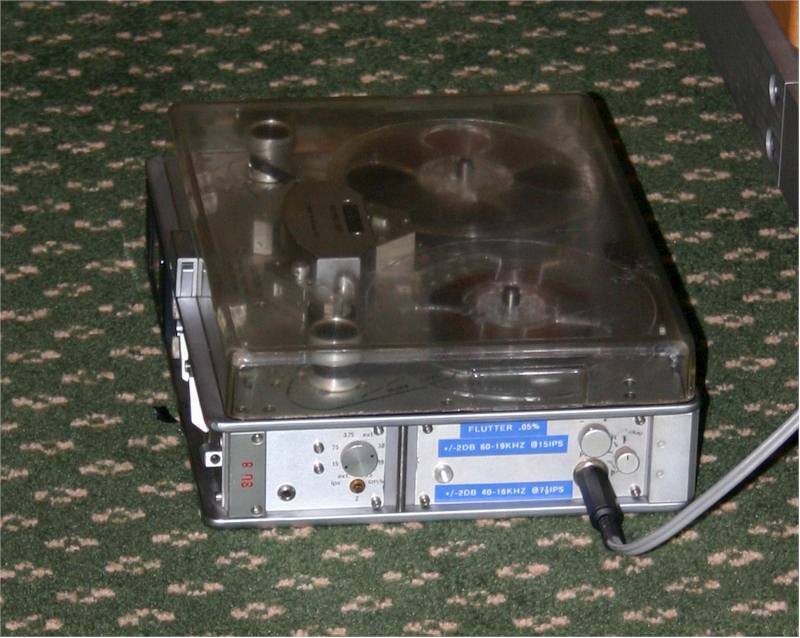 Oh cool -- a reel-to-reel deck. StellaVox -- gotta remember this. Why didn't Mike put a vibration control platform under this thing? Oh gawd, look at those horrible interconnects." From Jarmo's and my perspective, she was making us absolutely crack up because it looked like she was walking over to the rack and suddenly saw this Alien Thing, something that seemed to have sprouted right out of the carpeted floor.... And she goes over and peers down at it in a What the Hell is This Thing Anyway maneuver... and oh-my-god it appears to be attached to our System! Then, to verify, this unnatural state of affairs, she peered with trepidation behind the Lamm to see if, in fact, it was in actually, really attached. And yes, it is, and then she looks around the room, sees me laughing and gives me the look wives give husbands in these kind of situations. So, for those most eccentric audiophiles who want to spring for a $11,000.00 to $50,000 or so (new) reel-to-reel and are willing to hunt for the few reels out there that are left which are hopefully low-generation dubs off the masters - you have a very special treat in store. And a huge thank you to our visitor with the Stellavox deck -- we'd love to hear from you, and bribe you into bringing that thing and some more of your awesome tapes to our shop for another audition. It took us about 2 hours to take down the system and pack/wrap everything up. It took almost another 2 hours to cart it all down to and stuff everything into the minivan and sedan. And getting it back up our 45 steps? We'll leave that to your imagination. The early mornings were the slowest, as is typical of shows which are on multiple floors, as people start at the bottom and work their way upstairs (as attendees, we usually start at the top in the mornings, where the rooms are less crowded, so we get to sit in the sweet spot in as many rooms as possible). It was during these times, and when Dan was kind enough to spell us, that we got out and about to hear the other rooms. More on these listening experiences in the next part of our report.